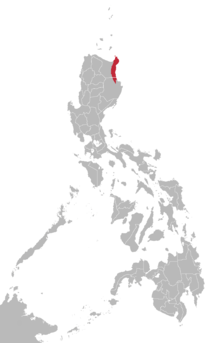 Dupaningan Agta (Dupaninan Agta), or Eastern Cagayan Agta, is a language spoken by a semi-nomadic hunter-gatherer Negrito people of Cagayan and Isabela provinces in northern Luzon, Philippines. Its Yaga dialect is only partially intelligible. Robinson (2008) reports Dupaningan Agta to be spoken by a total of about 1,400 people in about 35 scattered communities, each with 1-70 households. Palaui Island - Speakers do not consider themselves to be Dupaningan, but the language is very similar to that of the other Dupaningans. Where symbols appear in pairs, the one to the right is voiced. ↑ Robinson, Laura C. 2011. Dupaningan Agta: grammar, vocabularly and texts. Canberra: Pacific Linguistics. 1 2 http://www.ethnologue.com/language/duo Lewis, M. Paul, Gary F. Simons, and Charles D. Fennig (eds. ), 2013. Ethnologue: Languages of the World, Seventeenth edition. Dallas, Texas: SIL International. ↑ Hammarström, Harald; Forkel, Robert; Haspelmath, Martin; Bank, Sebastian, eds. (2016). "Dupaninan Agta". Glottolog 2.7. Jena: Max Planck Institute for the Science of Human History. ↑ Robinson, Laura C. (2011). Dupaningan Agta: grammar, vocabulary, and texts (Pacific Linguistics PL635). Canberra, A.C.T. : Pacific Linguistics, School of Culture, History and Language, College of Asia and the Pacific, Australian National University. ISBN 9780858836464. 1 2 3 Reid, Lawrence A. 1994. "Possible Non-Austronesian Lexical Elements in Philippine Negrito Languages." In Oceanic Linguistics, Vol. 33, No. 1 (Jun. 1994), pp. 37-72. PARADISEC has an open access collection of recordings in Dupaningan Agta. These recordings include elicitation sessions, wordlists, stories, and songs. Sessions also include Ilocano, the local contact language, and occasionally also Tagalog.